Three-time Yukon Quest champion Allen Moore maintains the lead in this year’s race, as he was first out of Pelly Crossing last night at 9:37pm (PST). However, unofficially, former Quest winner Brent Sass has barreled through Scroggie Creek (a dog drop) and is about 100 miles from Dawson City. According to the leaderboard, Sass spent only 13 minutes at Pelly Crossing, while defending champ Moore took just over 20 minutes to leave the checkpoint. Hans Gatt of Whitehorse, who is currently listed in second position, officially, spent almost six hours at Pelly. The leaderboard shows Paige Drobny in fourth, while Michelle Phillips rounds out the top five. Wright says the reasons for a team to add dogs are as numerous as the mushers themselves. According to past race updates and Quest staff, trail conditions look good heading into Dawson City. Once mushers reach that almost mid-way checkpoint in the race, they will have a mandatory 36-hour layover waiting for them. To see how the leaderboard shakes up between now and then, tune in to KNOM Radio tomorrow morning at 8am for the next 2019 Yukon Quest race update, on 780 AM / 96.1 FM. 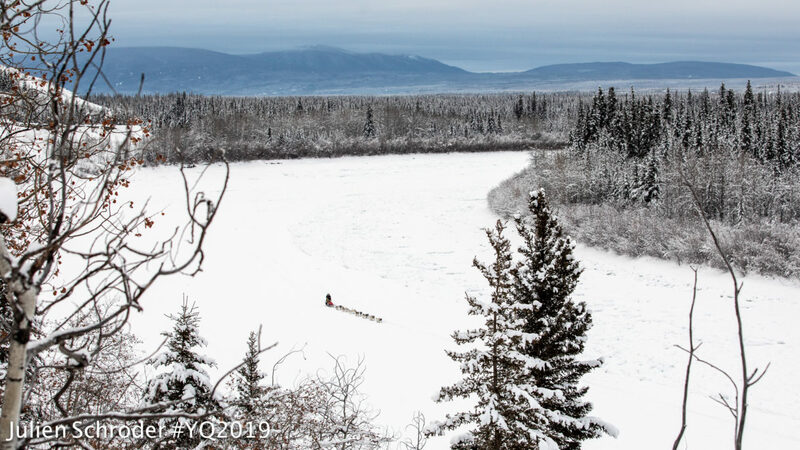 Image at top: Near Pelly Crossing during Yukon Quest 2019. Photo: Julien Schroder, Yukon Quest; used with permission.